In what has been an unbelievable season, I have finally been able to experience what a pennant race feels like at Camden Yards. I went to last night's game with Ryan from 'O No Another Orioles Blog' to catch the Brooks Robinson statue unveiling (which I will post later). People were still filing into the stadium as the game started at 7:15PM. You can see the crowd on Eutaw Street. We tried to look around in the team store down there, but you had to grease yourself up just to squeeze in there. It wasn't worth dealing with that mess to pay $30 for a Dylan Bundy T-Shirt. I didn't buy anything except for a game program as we walked into the stadium (I also got a free Brooks Robinson statue; which, like I said, will be posted later on). Check out these crowd shots. The place was jumping as the game went on. It gave me goosebumps to hear the whole crowd screaming for the Orioles. There were a few Red Sox fans there, but they were well outnumbered, for once. Here is a shot of Jim Johnson closing out the game for his 49th save of the season. The Orioles won the game with a score of 5-4, reducing their magic number to 2. The crowd went nuts after the final out was recorded. I was screaming pretty loud, and so was Chris. At the game, it was me, Chris, my wife, Ryan and his wife. We all had a really good time. I hope I can experience more games like this in the future. Oh yeah, with the win, the Orioles pulled into a tie for first place with the Yankees, with 4 games left to play. Who would have thought, at the beginning of the season, that the Orioles would be in this position. My mom gave me a couple packs of 2012 Topps Heritage that she picked up recently when I was visiting on Saturday. I opened the packs in front of her and she was a bit disappointed to see that I didn't get any big hits (or any Orioles). 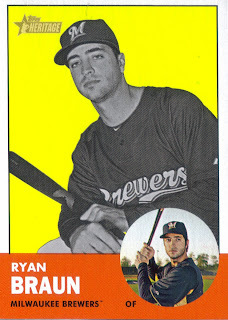 I got home and looked through both packs again and realized that there was something different about the Ryan Braun card that was in one of them. The photo was in black and white, unlike the rest of the cards. I looked it up on COMC and discovered that it was a B&W color swap variation and the book value is $10. So, Mom, I did get a pretty cool hit! Thanks for the packs, Mom. It was nice to open some cards with you for the first time in about 15 years or so. I feel a little bad for Jim over at GCRL. His trade gets to follow the epicness of what I posted yesterday that was obtained in a trade with Jason from Joe Average Collector. That shouldn't take away from what Jim sent me, however. It was just the timing aspect on my part. I sent Jim a few Dodgers Topps Chrome cards in exchange for a couple vintage Topps cards. 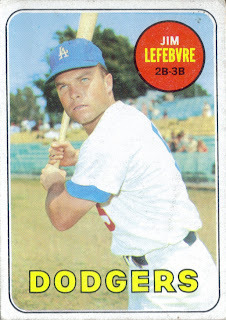 Normally, I don't have Dodgers for trade, since they usually go to a friend of mine, but I believe he has gotten out of cards, so Dodgers cards are becoming more readily available for trade. It worked out for me, because I was able to take two cards off of my want list. 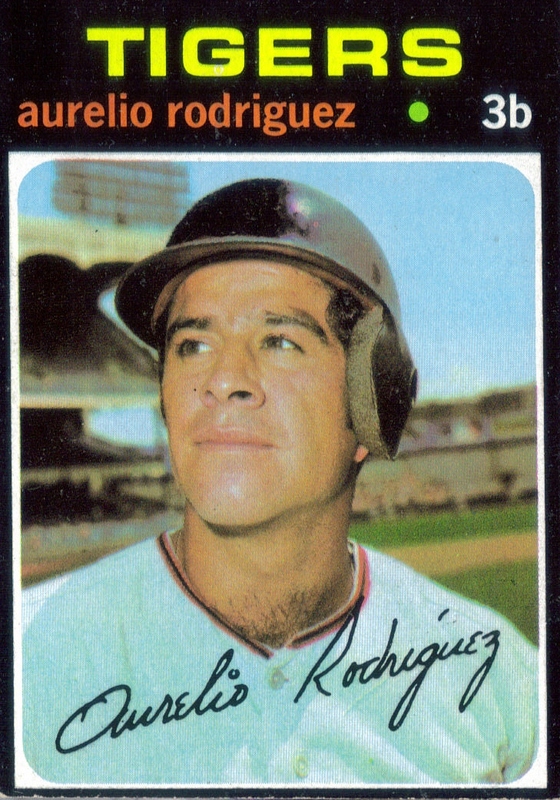 This Aurelio Rodriguez is a mid-numbered 1971 Topps, so it was especially nice to go ahead and take it off of the list. I really need to get on the ball and finish out this set. Those darn high numbers are slowing me down. Thanks again for the trade, Jim. I appreciate it and I think we will be able to swing more trades in the future since my friend is now MIA. I completed one of my most epic trades in recent memory with Jason from the blog Joe Average Collector. Jason is a Rockies fan and a Veteran of the Iraqui war. He commented on my trade bait update post saying that he had a Cal Ripken plate that I might be interested in. Of course I was interested in the Cal plate, but when he emailed me to tell me that he also had a 2010 Topps Nolan Reimold printing plate, well, it was on! So, here is the Nolan Reimold plate. It's funny, I got the plate before I got the black parallel. Once I get the black parallel, I believe I will have every kind of parallel from 2010 Topps. I'm actually excited about that. I might keep an eye out for the other plates. 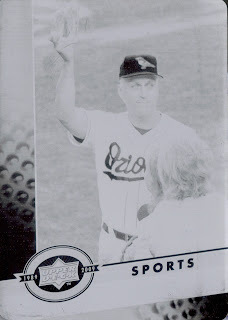 This is another one of those times that I can say on this blog that I was able to pick up a Cal Ripken card that I didn't already have. Again, it is nice to add a Cal that I didn't have before, but in this case with it being the first Cal printing plate that I have picked up, this is especially sweet. 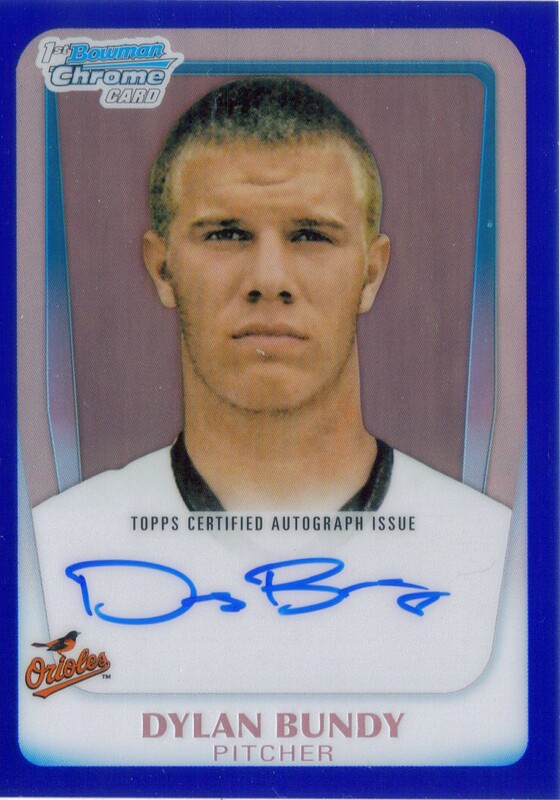 I'm guessing that at some point, Jason was an Oriole collector. If he wasn't, man, he ended up with some random stuff. He sent me a multitude of Orioles memorabilia, including the above pennant that I can add to my wall. Based on the script, it looks like this was a late 80s, early 90s pennant. Jason also included a late 80s early 90s Orioles bat/ballboy jersey. Pretty sweet. It is definitely aged, but still pretty cool. I will likely hang this up in the man cave. Jason included a huge stack of Orioles cards, most of them are Cal Ripkens. I need to through all of them and see what can be added to the PC and which can go into Chris' albums. He was really interested in getting some of them, so I think I will pass a few off to him. That way he feels like he got some mail, too. Here is a really cool helmet from the late 80s. It looks like a giveaway or promo deal. It is pretty cool. I have a helmet that my brother Andy gave me, so this will probably be put with it. Jason also included this really old O's hat. It looks more early 80s than the rest of the stuff. I'm going to wash this before this weekend and let Chris wear it to the game. That is if I can keep a hat on him. Ok, so, this is where it gets interesting. As if it wasn't already interesting. Jason emailed me the trade confirmation and stated everything that he was going to include in my box. He told me that he was including a relic from the Iraqui War, and I wasn't quite sure what that meant. I know unexploded ordinance can't really be shipped via USPS, so when I got this Iraqui money featuring the former public enemy number one, Saddam Hussein, I was amazed. I honestly don't know what to think. I mean, it is really cool and it is something I am going to hold onto, but that's Saddam Hussein! Kind of a funny feeling when you look at it. So, Jason, this was definitely an epic trade and I really appreciate it. You will be getting Rockies cards from me whenever I can find them, that's for sure. On Friday, September 21, 2012, Tom Umphlett passed away at the age of 81. He had played for the Red Sox in 1953 and the Senators in 1954 and 1955. I discovered that Mr. Umphlett was from a small NC town that I visit frequently, as I do a lot of my environmental consulting work there (that is where two of our clients have their home offices). I thought it was cool to send a ball off to a former player that I had the possibility of bumping into at a gas station or Wal Mart, etc. I don't know the cause of death, but at 81, it probably could have been a multitude of things. It is sad, however, no matter the cause. I never knew the guy, but I appreciated his generosity when it came to taking the time to sign my ball. I will say a prayer for his family and be thankful I had this small interaction. 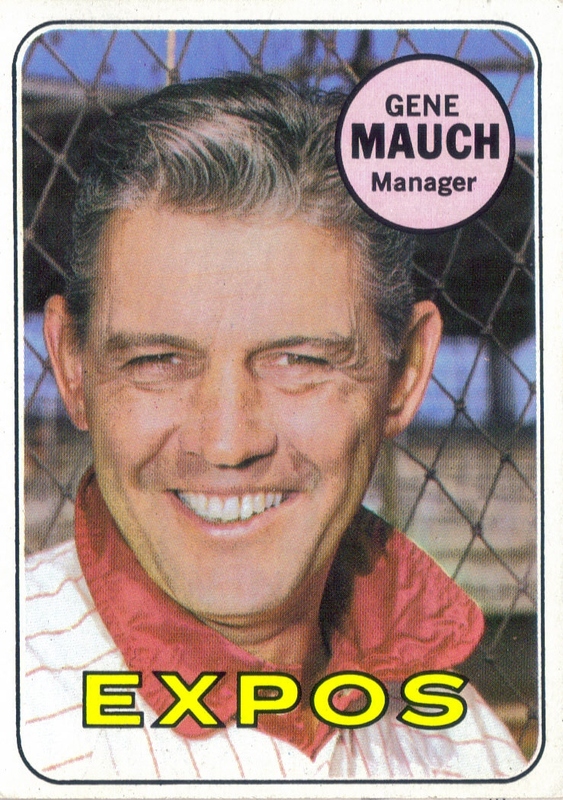 I haven't really thought about it until now, but given the age demographic of the players I have been sending to, and the 64 TTM successes I have received, only two have passed away so far. It is inevitable, for sure, but I don't like to think about it. I'm not one of those guys who likes to dwell on that type of thing nor do I entertain the thought of selling my ball, just because the player had died in hopes of cashing in. I intend to keep my baseballs as long as I am around and probably will pass them on to my son later on. For a more positive look at Mr. Umphlett, here is a link to my TTM success from January 11, 2012 and here is a link to Mr. Umphlett's obituary. I got a nice package in the mail Friday before we left town from my friend Andrew. This was his birthday package to me, along with catch-up for a few trades. He included several cards that I will likely use as trade bait for Orioles cards since he didn't have a whole lot of them to offer. Trades or COMC bait. Oh yeah, hit up my link at the top of the blog to see what is being offered on COMC. 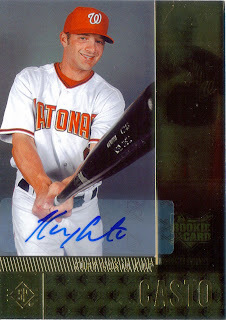 This is a pretty sweet Kory Casto auto from 2007 SP Rookie Edition. 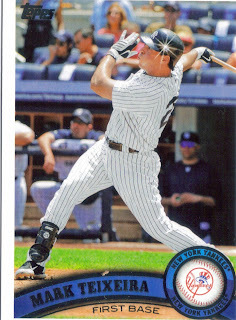 Casto was a 3rd round pick of the Expos in the 2003 draft. He played a few games in 2007 and 2008 and has since been out of MLB. It looks like he last played in 2010 in AA for the Diamondbacks. 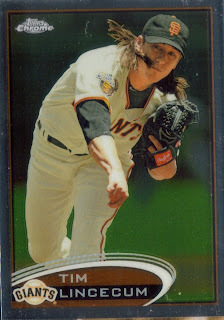 Here is a 2011 Topps Hope Diamond of Jason Pridie. He was a second round pick by the Rays in 2002 and played a few games this year for the Phillies. It looks like Pridie still could get a shot in the majors. Here is a relic card out of 2012 Topps of Pirates reliever Evan Meek. 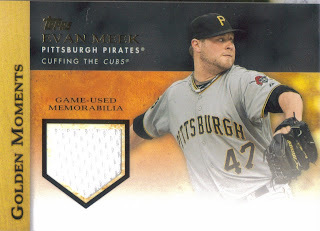 Meek was an All Star for the Pirates in 2010. 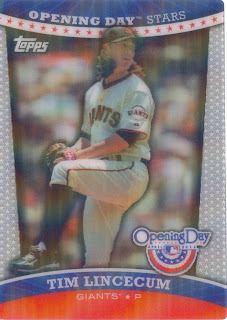 Finally, here is a 2012 Opening Day Stars Tim Lincecum. These cards are really cool. They remind me of the old Sportflics UC3 cards from the 1990s. I actually miss those cards. They were a real cool concept and I, for one, bought a bunch of Sportflics packs way back when. Thanks for the birthday package, Andrew. It is much appreciated! I spent the weekend hanging out with my parents, grandmother and most of my brothers and sisters while we watched my dad race at Farmington Dragway. One of the benefits to being in the Winston-Salem area was that I was able to pick up my Cal Ripken replica statue that my good friend Jim was able to get for me. I love the replica statue and can't wait until I can go to this coming Saturday's game and get my Brooks Robinson statue. It will also be a key game in the pennant race, I'm sure, so I am excited to finally attend a packed game at Camden Yards. Thanks again for picking up the statue for me, Jim. You're an awesome friend, and this was very much appreciated! 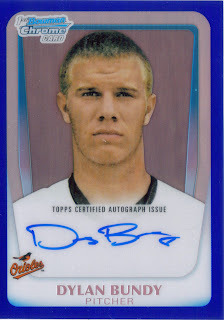 After last night's marathon 18 inning affair with the Mariners, the Orioles have called up their number one prospect, Dylan Bundy. The Orioles used 8 pitchers in the game last night, so they needed someone in the bullpen tonight, just in case Joe Saunders gets shelled and can't pitch deep into the game. Bundy was supposed to have been shut down and sent to instructional league in Florida, but last night's craziness facilitated the move. I should be worried. I mean, in years past, the rushing of certain pitching prospects to the majors seems to have continually had a negative impact on the organization. However, in Bundy's case, I think this was a good move. It speaks of Tampa's promotion of then prospect David Price in the latter weeks of the 2008 season. Price came in out of the bullpen and was dominant during the Rays' postseason run that year. I'm hoping that Bundy can have a similar impact on the Orioles. I now have 50 cards listed on Checkoutmycards.com in an attempt to flip some stuff that has been languishing in my box for some money or other cards. Ryan from O No Another Orioles Blog talked me into giving COMC a shot, and gave me a coupon from the National Card Show for $20 off first time seller fees. It was interesting getting stuff submitted to them, and surprisingly easy. They scan everything and give you BV for each card (if available). You then tell them what you want to list your card at and wait for offers. The stuff I submitted was some higher end oddball stuff like a 1/1 Nate McLouth sketch card, a couple 2011 Topps Sparkle Cards, a nice 2007 Topps Turkey Red Justin Verlander silk, a couple printing plates, etc. We'll see if I get any offers, but I am excited to see how all of this plays out. Here's to hoping I can flip some of that stuff for a few signed baseballs or something. Check out the stuff I have listed, seller ID is wregenthal. I got a nice birthday package today in the mail from my good buddy Scott. 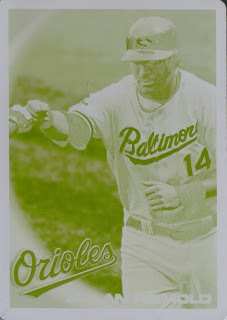 Inside the package was a good bit of Orioles cards from various years. 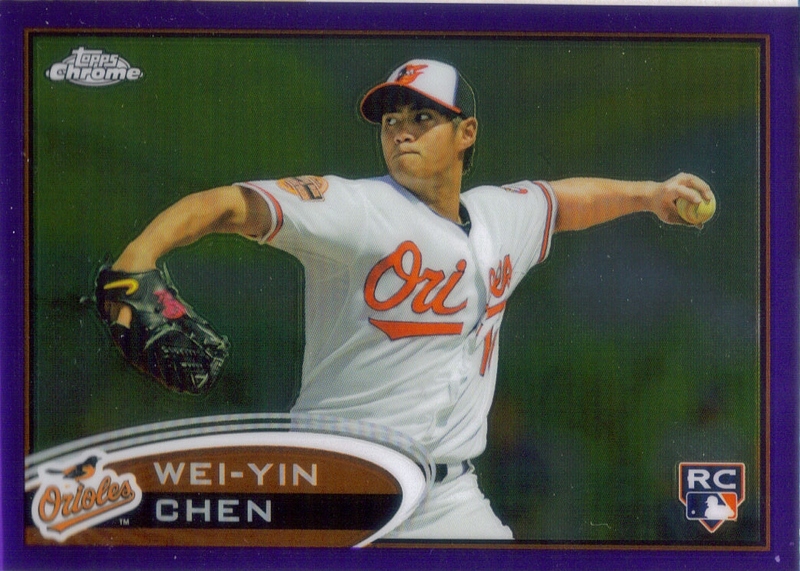 The highlight of the package was the below Wei-Yin Chen purple rookie refractor from 2012 Topps Chrome. This is a really pretty card. 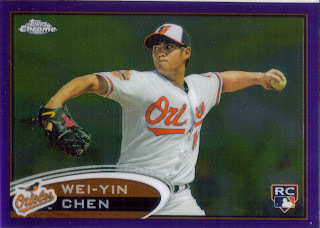 I like the different colored refractors, so getting one of Chen (and a RC) was a plus. I'm pretty sure I didn't already have this Cut Above Cal Ripken. 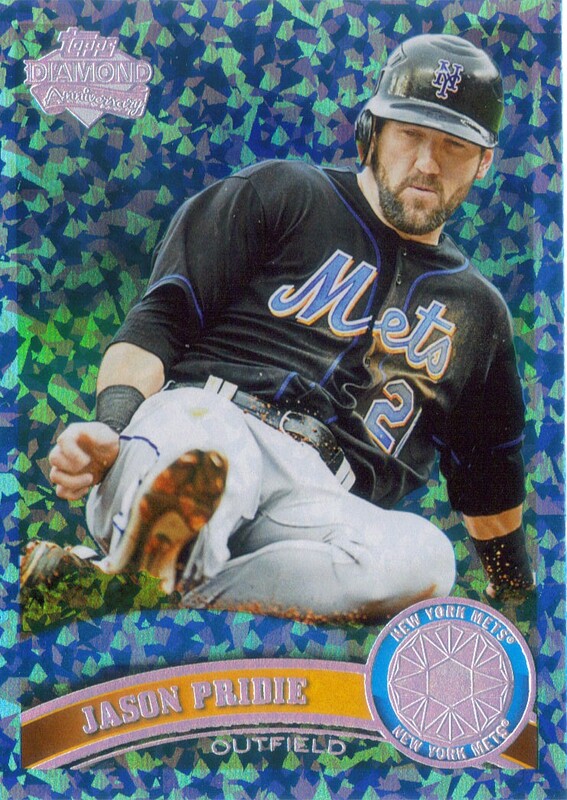 I may have pulled one from 2012 Topps Series 2, but I can't remember. 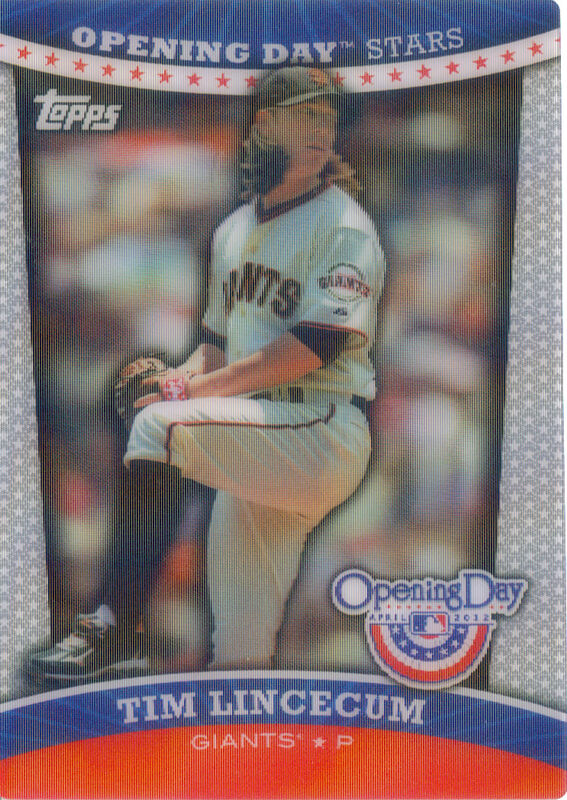 It is a nice card and it is nice to be able to continue to add new Cal cards each year, long after he has retired. Here is a nice 2010 Topps Chrome Mark Reynolds. 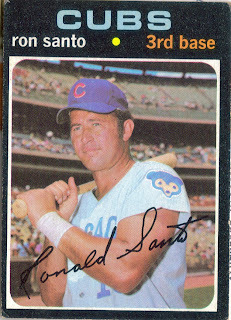 I'm sure I had several of these cards, but probably traded them away long before Reynolds was complacently devouring sunflower seeds as an Oriole. I'm glad I have it now and will add it to my Reynolds PC. Finally, you can file this one under 'blast from the past.' 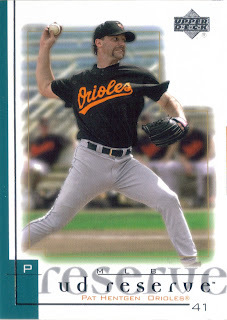 I forget sometimes that former Cy Young Award winner Pat Hentgen pitched for the Orioles. Hentgen was signed before the 2001 season to be a part of the Orioles' rotation, but injuries ruined his time in Baltimore. It would have been nice for him to be healthy in Baltimore, but it wasn't meant to be. So, thanks for the birthday package, Scott! I really appreciate it! I finally took a second and updated my want list and trade bait pages. I would like to trade a bit more, so let me know if I have something you might be interested in. I got some comments when I posted about Topps Series 2 that a few of you might be interested in some of the relics and autos. Please email or comment and let me know if there is still interest. I tried to add more to the want list page, including more of an emphasis on my PCs as opposed to solely listing my set building needs. I'll try to continue to add to that as I determine which cards I need for my PCs, etc. I split up my Braves cards between three people. If you are interested in getting cards of teams not mentioned, all you have to do is email me and we can work out a regular trade pattern. I'm pretty easy to work with. I also have a good bit of 80s-90s junk wax that I'm looking to unload. Several completed sets, some opened wax boxes, etc. If any of you are interested in taking this stuff off of my hands, they are listed on the trade bait page. Again, just email me and we can easily work something out. Finally, as of tomorrow (September 17, 2012), I will be selling cards on checkoutmycards.com under the seller ID of wregenthal. I have several 1/1s, some relics, autos, sparkle inserts, etc etc (a total of 50 cards for now) that will be listed. If you see something listed on there, all you have to do is contact me through COMC or shoot me an email and we can discuss. I hope some of you might be interested in all of this stuff. Again, I'm working toward trying to get a little more active in trades as well as clear out some room as I build some more inventory for some future card shows. Here are some of the cards I got from Drew as part of my birthday package. Drew sent me a few 1969 and 1971 Topps as well as some Orioles, a Jimmie Foxx and a Tim Lincecum. 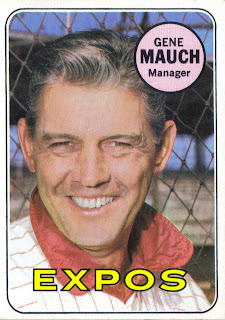 In all, I got 4 1969 Topps that I needed for my set. I've got along way to go to completing the set, but I've started nicely. It will likely take me several years to wrap it up, so any piece I can get to knock it down is always welcome. Here is one of the 1971 cards I got, Ron Santo. Santo is newly elected to the Hall of Fame, and rightfully so. He played his entire career as a diabetic and lost his legs to the disease later in life. It definitely is too bad that he did not live long enough to enjoy being elected to the Hall. Finally, a personal favorite of mine, Jimmie Foxx. I have done a lot of reading and discussing about the career of the Beast. He is one of the greatest power hitters of all time, and I have held a World Series ring that he was a part of winning. So cool. 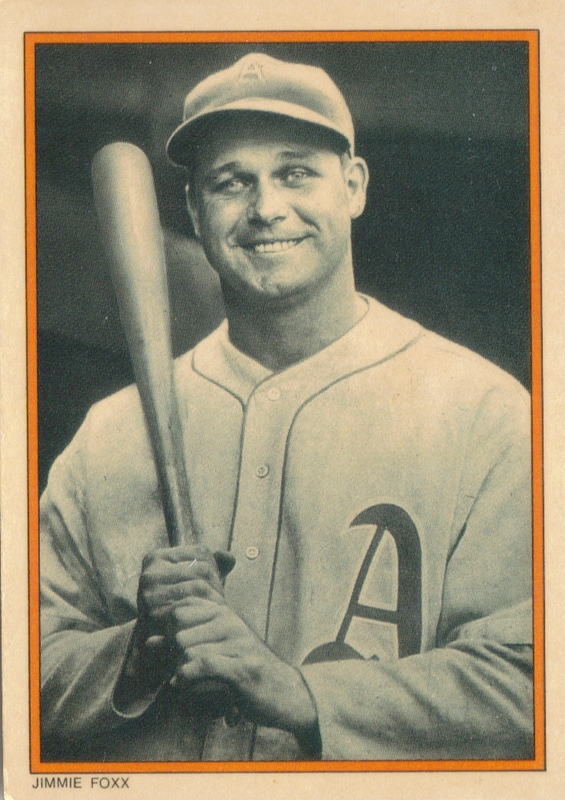 One day, I will own a Jimmie Foxx signed baseball. Just you watch! I am taking donations, by the way! So, thanks again Drew for the awesome birthday present! I really appreciate all the cool stuff! I know I'm not the only one that feels this way, but Topps' 2012 redemption/giveaway promotion is pretty lame. I loved the ones from the last 2 years where you got actual cards for your codes. Yeah, some of them (ok, most of them) were late 70s to 80s commons, but the thought that you could get a 50s card from your redemption code made it a lot of fun. This year, I redeemed 60+ codes and got a multitude of 'virtual' coins (woo hoo!) and one, count it, one card. One card out of 60+ codes. Uggh, lame. 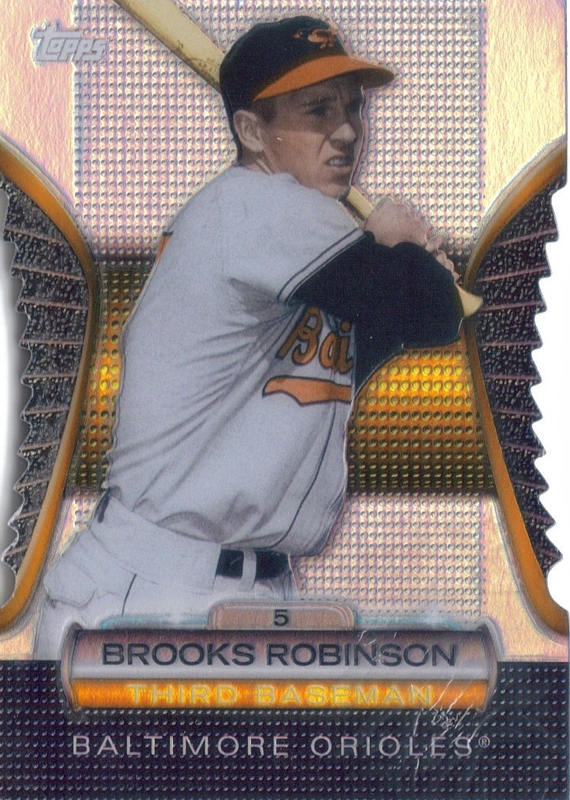 Well, I had just about given up on the whole thing a couple months ago and took a chance that someone would fall for a trade of the card I got (Golden Die Cut David Ortiz) for the Golden Die Cut Brooks Robinson. So, I was bored the other night and decided to log onto the Golden Giveaway website and redeem 7 codes that my brother John had asked me to redeem (yep, 7 more virtual coins). I decided to click on my portfolio and check out my one card and was amazed to see that the Ortiz was replaced with the above Brooks Robinson. SUCKERS! I can't believe someone traded a David Ortiz card for this AWESOME Brooks Robinson. Of course whomever got my Ortiz is probably thinking SUCKERS, I can't believe someone wanted that Oriole guy. Trust me, I would much rather have Brooks than Papi, so I was really happy to pay the $2.92 to have this delivered to me. The card looks good. As you can tell, I haven't removed the protective film (nor will I). I might look for a few more of the Orioles out of this set, because it does look good. I imagine that the cards hold a bit of a premium, so the Cal Ripken will likely be really high. Oh well, something to shoot for. So, stay tuned guys for a look at some of the cards that Drew included in the birthday package he sent. I'm off to eat some cookie cake and watch a movie for the rest of my birthday! Drew has outdone himself this time. I never expected my good buddy to surprise me with a present this year for my birthday (which is tomorrow), so when I came home to a box and saw what was inside, I was definitely excited. Drew contributed my 76th Hall of Fame signed baseball to my collection. Fisk (born in 1947) played in the majors from 1969, 1971 to 1993 for the Red Sox and White Sox. He is one of the greatest catchers of all time. 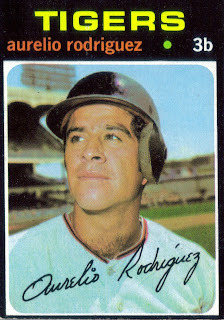 The 1972 AL Rookie of the Year. His home run in the 1975 World Series against the Reds is legendary. His lifetime numbers are either at the top or near the top in all categories for a catcher. 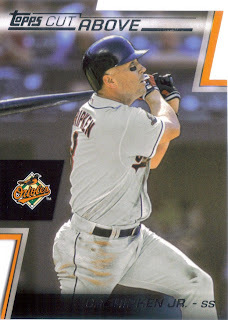 2,356 hits, 376 home runs and a .269 batting average over 24 seasons is very impressive for a guy who caught 2,226 games (a record that has just been passed by Ivan Rodriguez). Fisk was elected to the Hall of Fame in 2000 (his second year of eligibility) when he was named on 79.6% of the ballot. Thanks so much for the ball, Drew. You've been an awesome friend and I can never put into words how much that means to me, so I will again say, thank you! I wasn't going to blog tonight. I got home really late from being out in the field today, but after taking a shower and sitting for a bit, I decided to go ahead and post tonight. 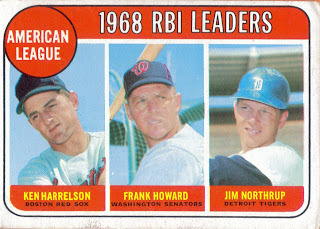 So, here are some more 1969 Topps I got from Sportlots the other day. 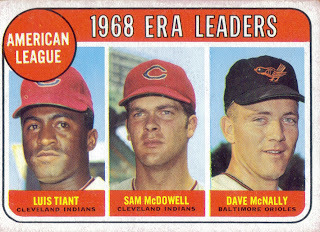 I like these ERA and RBI leaders cards because most years you end up with some oddball guys who aren't your typical league leaders. 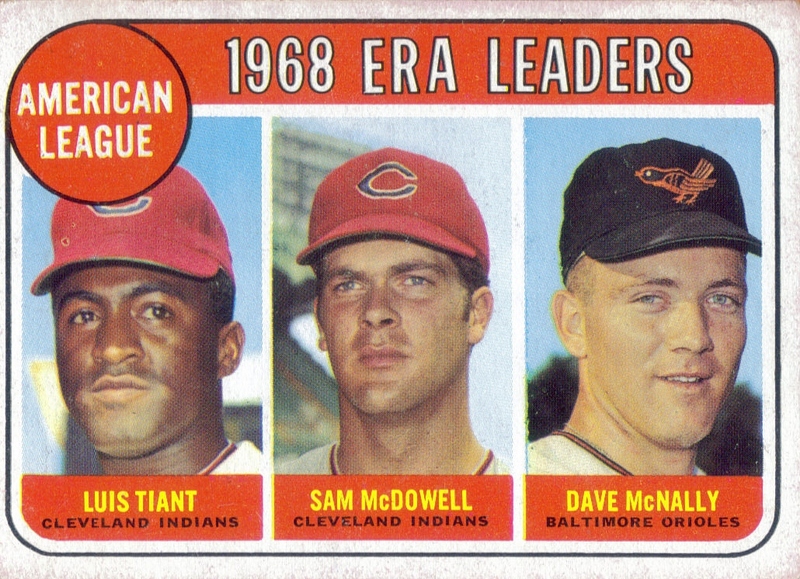 I like that the above ERA leaders card has an Oriole, Dave McNally. McNally was a really good pitcher for the O's for several years and at times is overshadowed by Jim Palmer and Mike Cuellar in that era. 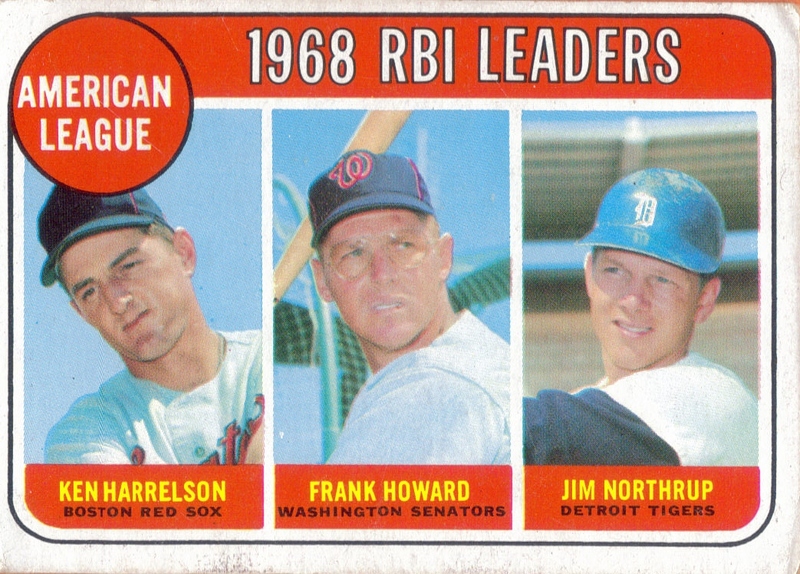 Check out the guys who led the AL in RBIs during the 1968 season. Frank Howard is the only one that I had heard of off the top of my head. The others I'm going to have to take a minute to look up. Not tonight, though. I'm too tired. Well, that was easy. 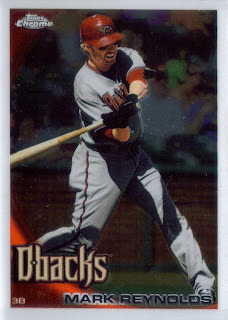 I was able to complete the 2012 Topps Chrome set by making 2 trades. One of the trades ended up being a tad redundant because the second trade was for a complete Chrome base set. Now, I have a ton of Chrome singles, in order, missing quite a few in order to complete another set. I got the completed set from fellow blogger Brad who is the proprietor of the blog: Brad's Blog. All I had to do was send him some Phillies relics and autos and he hooked me up with the set. Pretty easy transaction. I got an email from Brad seconds after I had committed to a trade with a friend of mine from the old card shop named Zach for all of his commons. So, now I have a ton of Chrome commons, haha. Oh well. I made two trades in a day when it has been forever since my last one, so I'll take it. I wouldn't mind making more trades (wink wink nudge nudge), so hit me up. It's about time. 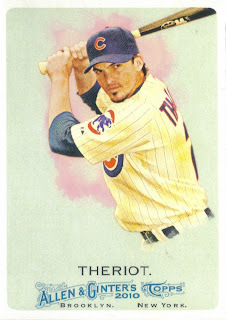 I have been working on the 2010 Topps Allen & Ginter set since they came out in July 2010. I had been a huge Ginter fan since the set debuted in 2006, but the concept (and price point) has worn on me. I will always have a soft spot for A&G, but I think it has been played out. Time for Topps to issue another retro themed set, using a design like American Caramel, or something like that. I'm glad to finally be able to file this set in my closet and move on to something else. When I got home from my trip to Pittsburgh, I was happy to find in my mailbox, several mailers containing more of my latest order from Sportlots. I knocked off 3 more 1959 Topps, beginning with card number 1, Ford Frick. I wonder how pleased some collectors would be if they opened a pack of cards and one of the cards inside was of Bud Selig. 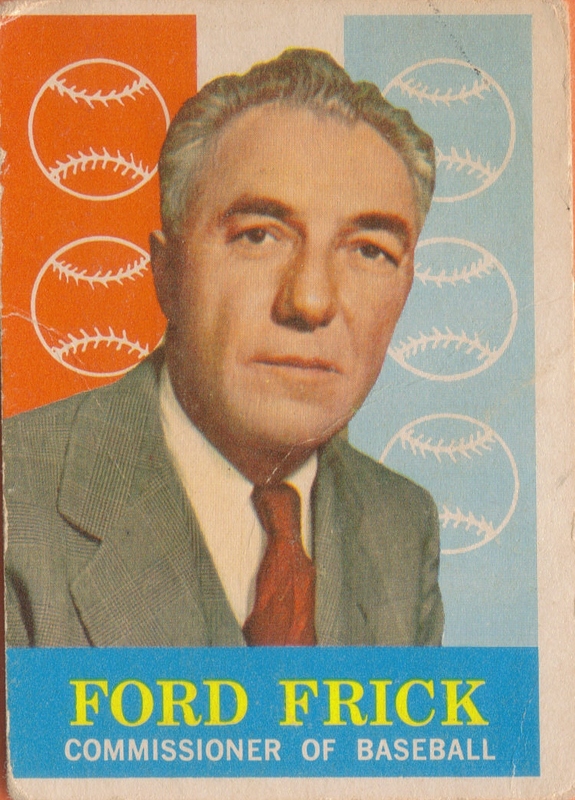 That being said, however, Frick is a Hall of Famer, and the namesake of the broadcasting award for the Hall of Fame, so he, clearly, is deserving of the card. 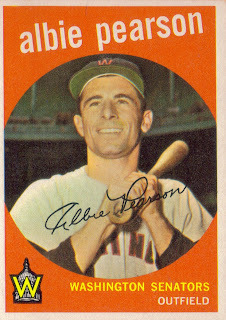 The next card is the 1958 Rookie of the Year for the AL, Albie Pearson. Pearson (b. 1934) celebrates his 78th birthday in just 3 days on September 12th. 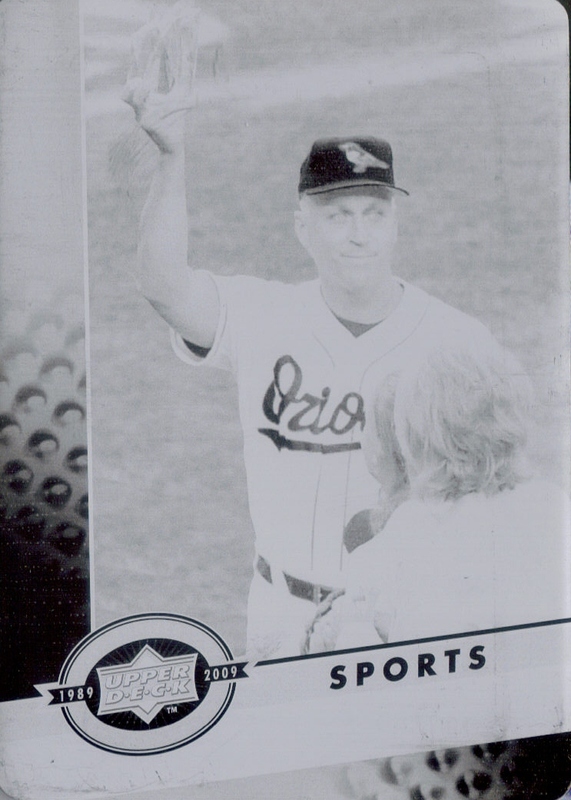 He played 1958 to 1966 for the Senators, Orioles and Angels. He would probably be a good choice for one of my next TTM attempts. We'll see. 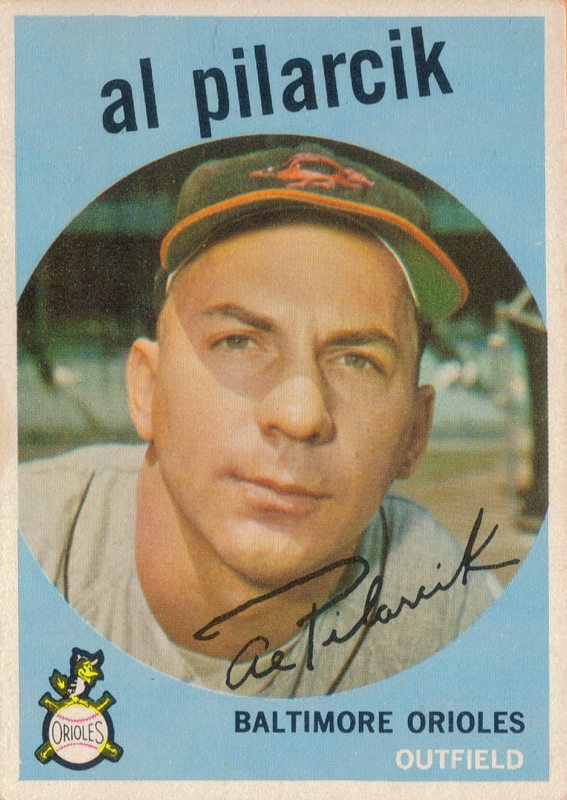 Finally, another former Oriole I picked up this go-round is Al Pilarcik. Pilarcik (who died in 2010 at the age of 80) played in the majors from 1956 to 1961 for the A's, Orioles and White Sox. This will be it as far as me buying single cards for a while (apart from the ones that I have yet to blog) since my birthday is next Friday (the 14th). My want list is up to date, so maybe someone (Mom, cough cough) will want to use it to help them out, haha. I enjoyed the ballpark and city so much when I visited last year, I decided to make a return trip to Pittsburgh, PA to catch a Pirates game as they cling to postseason hopes this year. They hosted the Cubs in what should have been a better outcome for the Pirates, but they ended up losing the game 4-3. We got to the ballpark just before the game started, so we didn't even try too hard to get autographs, although it would have been nice to get Andrew McCutchen. Oh well, maybe next time. Here is a really good shot that I took of Cutch getting beaned in the first inning. He didn't have a good game, as you can tell. The picture below is one of McCutchen popping out. He ended up going 0 for 3 with a run. I went to the game with my son, my wife, a friend I used to work with and his wife. We had a really good time, although I was admittedly distracted toward the end of the game as I was scoreboard watching to see if the Orioles beat the Yankees. They did, so, in all, I had a really good night. I leave you all with this really nice night shot of PNC Park that I took as we were leaving. I thought I did pretty well on this.